Parts made by the following high quality companies- Water pump (Hepu or Meyle), Timing Belt and Serpentine Belt(Continental), tensioner(NTN), Rollers (INA), Thermostat(Behr). -Cam and Crank Seals: Use the drop down box below to add cam and crank seals (includes both front cam seals and 1 crank seal). (recommended to do if yours are leaking) NOTE for Cam seal replacement: (NOW COVERED IN THE UPDATED DVD) Before you take the cam sprockets off, you must do the following if you don't have the cam locking bar. You need to undo the 16mm bolts on the sprockets, then mark very well with a sharp screwdriver and or chisel how the sprocket keys to the cam. There are no keys on the cam or sprocket, it is a tapered fit and will spin infinitely. So you must mark it before poping the sprockets off so you can put them exactly back where they were. If you don't mark it and put the sprockets right back to where they were then you will need a cam locking bar. JHM is currently working on finding a cam lock bar for 4.2l V8s since one is not currently available. 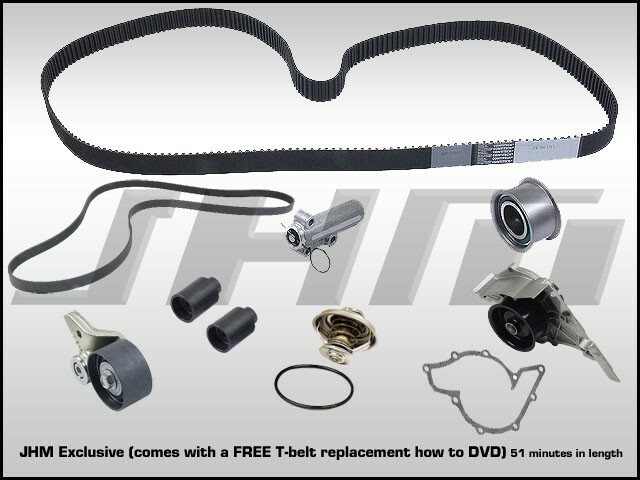 NOTE: This video shows you how to replace the timing belt properly and effectively without any expensive alignment bars or special tools. It also walks you through the Water Pump and Thermostat replacement.